Profile by Maria Hart: Commonly seen walking on the ground in flocks, the American Pipit is a petite greyish brown songbird with little to heavy dark streaking on the chest, a thin white eyering, and a pale eyebrow. They can be distinguished from similar-looking sparrows by their short slender bills. This species is often heard before they are seen as they fly overhead giving a shrill 'pi-pit' call. American Pipits breed up north in both grassy meadows and the mountaintops of the tundra region. Females construct a cup-shaped nest using a variety of small plant matter brought to her by her male mate. In order to impress female American Pipits, the male performs an alluring song and flight routine by flying to great heights (up to 100 feet!) while singing, and then plummeting down toward the ground, wings outstretched and tail feathers fanned. 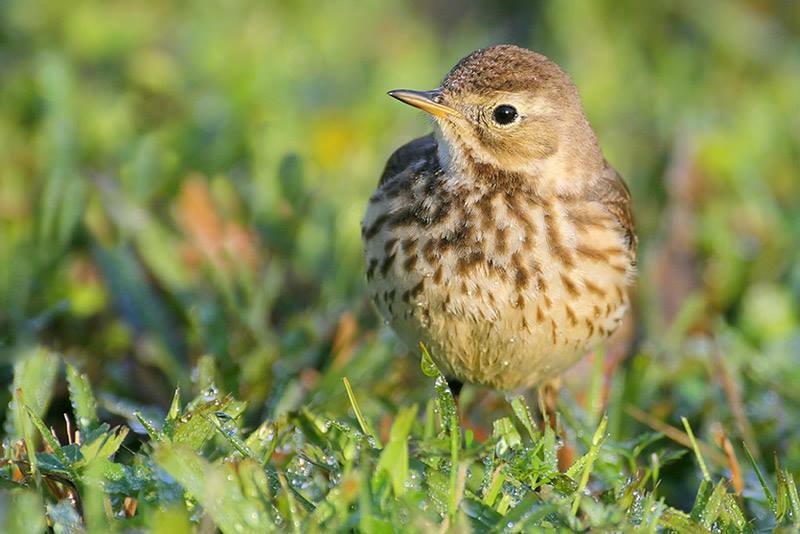 While the American Pipit nests in the tundra, they can be found throughout the country during migration and winter. They will be seen in various open-country habitats including beaches, marshes, mudflats, agricultural fields, and prairies walking along the ground while foraging and wagging their tails. 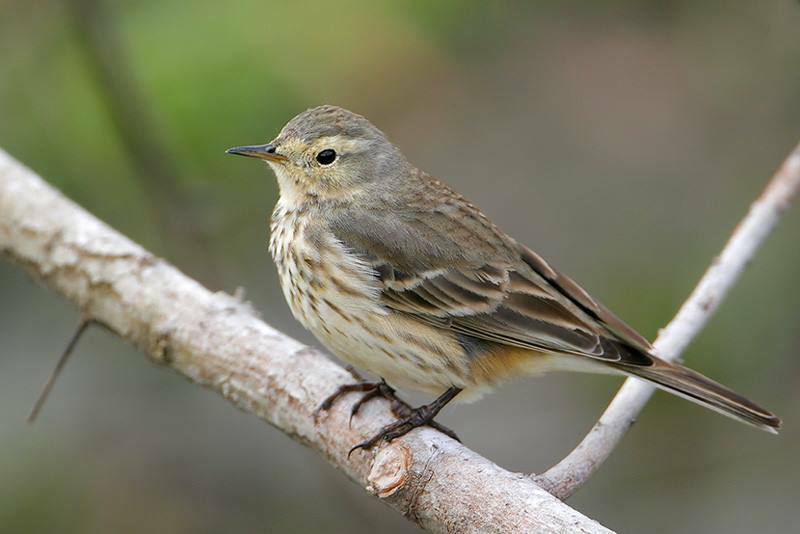 The diet of the American Pipit primarily consists of insects and insect larvae, seeds, and will also include small crustaceans and marine worms while wintering in coastal areas. 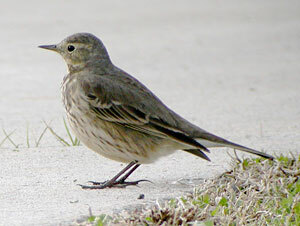 The American Pipit is still considered to be widespread and common. However, populations appear to have been reduced by nearly 30% in the last 50 years. This decline could be due to a diverse list of reasons including global climate change affecting and changing the landscape of their arctic breeding grounds, and the draining of wetlands which is a crucial habitat for them during migration and winter. 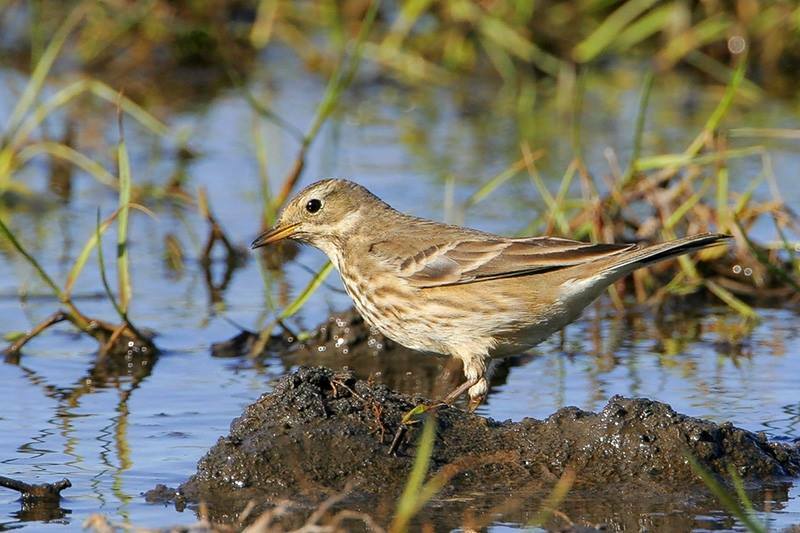 American Pipits are frequently seen walking among the wrack lines at the Bolivar Flats Shorebird Sanctuary.